Ahsoka Tano (Ashley Eckstein) runs into some mid-flight trouble in a new clip from Star Wars: The Clone Wars season six. Star Wars: The Clone Wars kicked off with a movie back in 2008, which led way for the TV series to begin shortly after. Twelve years later, Star Wars: The Clone Wars is wrapping up its story with a sixth and final season. This weekend is Star Wars Celebration in Chicago and during the event, fans got an awesome glimpse at Ahsoka Tano’s return in The Clone Wars season six. Fans can check out the exciting Star Wars: The Clone Wars clip featuring Ahsoka Tano thanks to DiscussingFilm in the post below. Star Wars: The Clone Wars takes place between 2002’s Attack of the Clones and 2005’s Revenge of the Sith. The franchise also delved into the world of animation with the fan-favorite series Star Wars: Rebels. The 2014 series Star Wars: Rebels takes place at a different point in time than The Clone Wars, though some characters from the series have crossed over. We’ll be sure to keep you updated on all news regarding Ahsoka Tano’s return in season six of Star Wars: The Clone Wars as soon as more information becomes available. 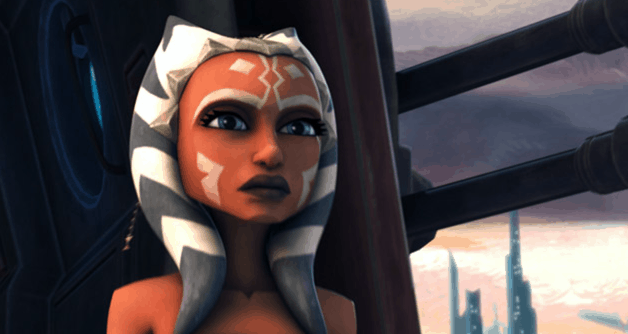 Are you excited to see Ahsoka Tano back in action? Which season of The Clone Wars has been your favorite so far? Let us know your thoughts in the comments below! Star Wars: The Clone Wars features the vocal talent of Tom Kane, Matt Lanter, James Arnold Taylor, Ashley Eckstein, and Dee Bradley Baker. The final season will debut on the upcoming streaming service, Disney+.